"The addition of voice actors that sound true to the characters and a significantly improved soundtrack make the deluxe version an AGS game not to be missed by fans of the genre." For a game with these high ratings it's a deception to me. The graphics are very good, the puzzles are O.K. but there are lot of things i didn't like. The interface is unnescessary complicated. The story made me expect something interesting to happen, but there wasn't, and the humor didn't work to good for me. I enjoyed everything about it except for the ending and the length, I was really expecting something exciting, particularly having to do with the knight in his dream and the statue in the barn. I think I would have preferred it more as a children's story than an adventure game. I submitted this review for Apprentice 1 but I intended it for Apprentice 1 Deluxe. So here it is. A great little game. 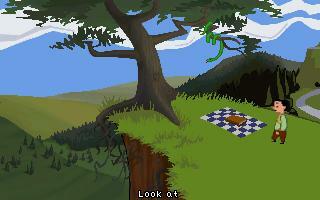 It has nice graphics, interesting characters, good puzzles and is very funny. It doesn't have much of a story and is rather short but is still a fun game to play. A real little pearl this game, despite it,s humble lenght. The graphics is really good and the music-track is among the best i have ever heard in a freeware title. The voiceovers is also good and read with insight. Puzzles, while not brilliant, works. The only thing that bothered me slightly was the GUI. It was cumbersome to have to switch commands for every object and i would have apprecitated if you could have switched commands with the right mouse button as well. But aside from that there is nothing to dislike about this game which reminded me a little of the monkey-island series. Brilliant game. The graphics and soundtrack however are outstanding and the voices make the game complete. The only bits about Apprentice that I found rather annoying or didn't like was the interface and the fact that it was waaaaaaay too short. The entire game however is amazing and other people should definatly put it on their to-play list. The ending is hilarious by the way. This game is excellent and the music and voices add a whole new level. The voice quality is exceptional and the music awesome. The backgrounds and consistentcy of them in Apprentice 1 is for me still the best. Like a bad film version of your favourite novel, Apprentice Deluxe just doesn't work for me. A lot of effort has gone into producing multiple language voice tracks and some of them work. Lord Ironcrow has a solid, booming comedy voice and Lloyd is brilliantly understated when he could have been hideously camped up and about as funny as Will and Grace. Sadly, the two main characters, particularly Pib, have been given annoying voices and the lines are often delivered without any energy at all. Its sad to hear lines that sounded so funny in your head being reduced to flat readings. While I loved the original game and warmed to all the characters, at the end of Apprentice Deluxe I just wanted Pib to die and ended up enjoying the moment where the saddle falls on him far too much. All in all, Apprentice Deluxe adds nothing to an excellent game. Perhaps if I'd played it first without having read the dialogue for myself I would have liked it but, sadly, this well intentioned release did nothing for me.